KIEV, Ukraine -- The encouraging news from Ukraine is that a crucial presidential election planned for Sunday is likely to go forward in much of the country, and to be free and fair. 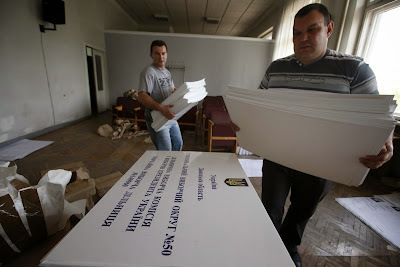 Members of a regional electoral commission prepare for the upcoming presidential election at the executive committee headquarters in the eastern Ukrainian city of Krasnoarmeisk in the Donetsk region May 19, 2014. “The legal framework, administrative capacity and political will in place suggest that a democratic process will be feasible in the vast majority of polling places,” said a report Monday by the National Democratic Institute, which has deployed an observer team. At the same time, it is already clear that in two eastern provinces, where 14 percent of the electorate lives, balloting will be next to impossible, thanks to forcible disruption by Russian-backed militants. The United States and its European allies have said they will impose additional sanctions on Russia if it disrupts the election or fails “to use its influence to prevent those efforts,” as White House spokesman Jay Carney put it last week. Six days before the election, that failure is blatantly evident. “There is intimidation,” a senior U.N. official told the Reuters news agency in describing the eastern regions of Donetsk and Luhansk. Ivan Simonovic, the assistant U.N. secretary general for human rights, said that a number of presidents and vice presidents of local elections commissions had been abducted or otherwise mistreated. Reuters reported that the last election commission attempting to operate in the city of Donetsk shut down Monday, leaving no voting operation in an urban area of 1 million people. Russian President Vladi­mir Putin seems to think that he can avoid responsibility for the disruption with rhetoric that suggests the opposite of Moscow’s actual behavior. For the third time, Mr. Putin announced Monday that the 40,000 Russian troops deployed on Ukraine’s border were withdrawing; for the third time, NATO’s secretary general and the White House said they had detected no such movement. The empty announcements may at least mean that Mr. Putin has set aside the option of an overt military invasion of eastern Ukraine for the time being. But dozens of operatives of Russia’s military intelligence service have been spotted in eastern Ukraine, where they have directed takeovers of government buildings. Mr. Putin could use those forces to clear the way for Sunday’s voting, or at least withdraw them and their sophisticated weapons so that the Ukrainian army could clear the remaining rebels. He has made no move to do so. In the coming days, the focus of U.S. and other Western officials will be, appropriately, on supporting the staging of the elections. Negotiations between the interim government and representatives of the eastern regions are also worth encouraging, though they appear unlikely to produce results in the short term. But President Obama, German Chancellor Angela Merkel and other E.U. leaders must also confront the reality that the latest “red line” they drew for Mr. Putin has been ignored. That must lead to the consequences they have promised: meaningful sanctions on the pillars that prop up the Russian economy. Важная задача нового Президента будет заключаться в ограничении аппетитов олигархических групп, установлении равноудаленных отношений с их лидерами, обеспечении прозрачной кадровой политики и наведении порядка в тендерних закупках. Об этом заявили ведущие украинские эксперты во время круглого стола «Влияние олигархов на Выборы-2014 и на современную украинскую политику». По мнению экпертов, нынешняя конституционная модель усиливает возможности для олигархических влияний как на кадровые вопросы, так и на экономику, пишет «РБК-Украина». Наиболее яркими примерами такого влияния они назвали распределение рефинансирования между приближенными к власти олигархами, а также попутки группы «Приват» выкупить государственную нефть из нефтепроводов со скидкой в 1 млрд долл. Больше всего внимания эксперты уделили обсуждению влияния на украинскую политику бизнесменов Игоря Коломойского и Рината Ахметова. Эксперты также отметили, что за последние 3 месяца Игорь Коломойский стал самым влиятельным олігархом Украины и если такая тенденция сохранится - за год он может стать и самым богатым. «Сейчас Коломойский союзник (власти - Ред. ), есть много позитивных оценок в его пользу, но начнется борьба. Как и любой олигарх, который хочет получить чрезмерную власть, он столкнется с противостоянием со стороны общества и части политической системы». Above is the copy of an article from ForUm.